It all started very early Saturday morning when I caught my middle girl, in the small hours, waking her younger sister sleeping in the bunk below. This has been a problem for sometime now. There’s been lots of warnings, lots of punishments, lots of talks about making good choices, in fact Saturday was the last day of her early nights that she’d been given for the very same reason. There was nothing more for it, she clearly needed a stronger message. We grounded her for 1 week. Not being allowed out to party with your friends at age 6 is inconsequential, so for now, being grounded means a complete lack of privileges and treats, we’ve also swapped the bunks about and she is now on the bottom bunk. Once we awarded her with her punishment she was told that we expected her to think about her behaviour and come to us with a proper apology. We waited, and waited and waited. We gave her several reminders throughout the day that we were still waiting to hear something from her. We still waited. By bedtime we gave up waiting and asked for an apology, which she gave. With no remorse. Sunday morning we woke up to the same. No lesson learnt. Sunday we decided to go out for sunday lunch as we often do. We suspected it wasn’t a great idea given that middle girl was moody, baby girl was tired and big girl was over enthusiastically being nice. But we wanted pub grub and an easy life, so we went. It was quite possibly the worst meal out we’ve had in 22 months. There was spitting out food, gorging and stuffing, wearing more food than was eaten and plain messing about with food. It was like feeding time at the zoo. A quiet afternoon and an early night followed! Monday morning I woke up feeling refreshed and ready for the week ahead. My morning trip to the bathroom was interrupted by my middle girl who stomped into the bathroom informing me she needed the toilet. Me: are you done yet I need to shower? Me: ok hurry up I need to have a shower. Me: have you had a poo? Me: (shouting) for gods sake xyz hurry up, quickly, wash your hands. Once I showered I got all the girls up so they could use the bathroom, brush teeth and get dressed. We have a very good morning routine and it usually works very well and requires little effort from any of us, which is always a bonus in the mornings I think! Seems today my baby girl forgot how to get dressed, being already irritated by the earlier bathroom incident I shouted, and shouted some more. We finally all made it down stairs for breakfast, albeit very rushed due our late start and delays. Breakfast was served, toast as usual. My big girl decided she didn’t want to eat it instead she was just going to play with it. Being very out of character for her I asked what was wrong. Me: do you feel unwell? Me: what’s the matter then? The conversation really went just like that, it was one of many bizarre conversations I’ve had over the last 22 months with my big girl. She is unpredictable, impulsive and unreliable. I know/understand/connect with her the least. So ultimately today my baby girl couldn’t dress, middle girl wanted to spend the morning sat on the toilet doing nothing, and big girl decided she’d like to just be naughty. They went to school. I cried, ate cake and cleaned my house, a lot. I knew there was a reason I didn’t like Mondays! Or is that Mornings! Or just Most days! I called and made the appointment with the counsellor today, its Friday. Providing I haven’t been committed to an asylum before then that is. I decided to keep my big girl off school today. She claimed to be well this morning but was unable to eat her breakfast, telling me her claims were not true. I later discovered that she had a sore throat and a headache. She still had to come on the school run with me as we have no one local to call upon during times like this. She seemed ok though, and happily skipped across the playground. We returned from school and it started. As soon we walked through the door she started the dictating and narrating. Mommy………………………….’ You get the message. I know why she does this, I understand that she needs to check that she can trust me to meet her needs, I know that she needs to remind me that she’s here incase I forget about her and I know that my calm predictable responses make her feel safe. This doesn’t make it, in any way, any less irritating. Fortunately for me, she is ill, and she only had the energy to keep this up for the morning, by the afternoon she was happy to quietly sit and watch a film. Dont get me wrong, she didn’t take her attention away from me entirely. Whenever I breathed differently, or shifted in my seat, or turned my head, moved my hand etc her eyes would immediately dart over to me. She was constantly watching my every move, all day. My big girl is always like this, today was just more intense because of the situation. I’m constantly being watched by all 3 of my girls, my every movement and my every sound is more important to my girls than any thing else in their lives, even sweets! I’m usually left feeling exhausted by the evening, my days feel like a very long job interview. My big girl is ill! Yeay! No I havent gone completely mad, nor am I being really mean. But I am pleased to know that my daughter is sick. I am elated, because for the first time ever, she told me! Apparently, without noticing my life has dipped into the darkness of depression, what a depressing thought. I saw my gp today about heart burn/acid refux. We got to talking about the cause of it and stress was mentioned. I was asked to complete a short questionnaire. I don’t recall many of the questions but I do remember ticking ‘never’ by the question asking if I ever wished I was dead. My gp did a quick score up and then told me that my score indicated that I was moderately to severely depressed. I was quite shocked by this news. ‘But I don’t feel sad’ I told her. I knew I was a little stressed out and had half expected a prescription of Gaviscon and advice to drink some calming camomile tea, so to discover I was depressed was quite a depressing revelation indeed! I was offered a combination of treatments, self help books, counselling and drugs! The D word made me feel quite panicky and against my GP’s advice I declined medication. The counselling and books however seemed quite harmless so I accepted her offer of those just to keep her on side. Although I did wonder how I’m supposed to concentrate long enough to read a book given that I currently have the attention span of a goldfish! but I’ll give it a go to keep her happy, I chose a book called ‘How to stop worrying’. The counselling offer made me feel a little excited if I’m honest, finally someone I can moan too!! I may become their worst patient, the poor counsellor may need counselling themselves after listening to me off load about my life! So I left the GP with a script for a book, a referral for counselling and an offer of drugs! Oh and some Gaviscon. It was almost like one of those trips to the supermarket when you buy everything but the bread you went in for, I’d almost forgot that my appointment was because I wanted something for my heartburn! I left with something else too, something I hadn’t expected at all. I left with lighter shoulders. I felt as if a weight had been lifted, but it was a weight I hadn’t even known was there?! This morning was no different to any other, I was greeted by the extra’s from the ‘Truman Show‘, you know the ones that walk about doing the same things day in day out, blending in to the background by being totally fake. Telling you only what you want to hear so as not to alarm you. You know the ones? Well that’s my daughters. Nothing is ever quite as it seems with my girls. I’m hoping someone will invent some sort of xray vision glasses that can see through a facade to what’s really underneath because trying to work out the truth behind every fake is oh so exhausting. My baby girl was abruptly woken from her sleep once again by my middle girl. End result one tired baby girl that forgot how to dress herself, looks a bit pale and flushed but can only tell me ‘there’s nothing wrong mommy’. Her food controlling behaviours have started to rear their ugly head again this last 2 weeks. We’re working our way back to daily occurrences again so I know there is something wrong, but what?! My big girl woke after her 2rd night of restless sleep, I have no clue why, what’s on her mind, what’s keeping her awake at night, is she worried about something? Is she frightened? I just don’t know because she won’t tell me ‘there’s nothing wrong mummy’ is all I ever get. Maybe she doesn’t know, maybe she’s too scared to tell me, but I know there’s something. In the car on the way to school she heard a story on the radio about a mum going to hospital so her baby could ‘be delivered’. She popped up in her seat eager to share her knowledge on this with her sisters. ‘Being delivered is when they get the baby, wrap it in a blanket and give it to someone else because they don’t want it’ she said. I quickly informed her and her sisters that the phrase ‘being delivered’ was just a way of describing that the baby had been born from the mummy’s tummy, and yes they did wrap the baby in a blanket but then they gave the baby to the mummy for cuddles. I asked her why she thought ‘being delivered’ meant that the baby was unwanted. Tears is all I got. I have no idea where that came from, to my knowledge she’s not known of any baby that had been given up at birth, and she knows that her and her sisters were not so I’m not sure why that was her understanding of the phrase. Did she hear something somewhere? Was there something on tv? Something at school? ‘I don’t know’ is all I got from her this morning but that’s all I ever get from her when I ask her about things, So how can I help her?! My middle girl was clearly delighted with her efforts to disrupt her little sisters sleep this morning, she sang, skipped and hopped her way into school this morning blowing her little kisses to me all the way. She was way too happy for me to not notice. What is it that she needs? Why does she only get this happy when her little sister is miserable? My 3 little unattached girls are the ones that are never hungry, never full, never hot, never cold, never ill, never sad, never scared, never worried. They’re the ones that just smile and spend their lives trying to convince the world that there’s nothing wrong and that they’re perfectly ‘normal’ and they don’t NEED you………………or me! When really, that’s exactly what they need, they’re just too scared to admit it. The poor family failed by all! Little did they know when they were matched with these 2 little girls that they had already been subjected to unbelievable trauma in their short little lives already. Trauma that would shape the rest of their lives. Trauma that would destroy their family. The end result for this poor couple was divorce and long-term prison sentences for both of their daughters before they were even 23 years old. 18 years of hell, no one can prepare for that! So how did this happen? Who failed this family? Who is to blame? My guess, everyone! Everyone who should have been there to support them didn’t. 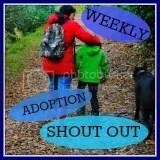 Adoptive family’s are failed every day by the people and organisations that promise to support them. They’re the ones who criticise, leaving the adoptive parents feeling inadequate. They’re the ones who judge, leaving the adoptive parents feeling hopeless. They’re the ones who turn their backs, leaving the adoptive parents feeling abandoned. They’re the ones who fail to provide, leaving the adoptive parents unable to afford the support services needed for their damaged children. Society as a whole fail to realise what a massive challenge adoption is, leaving the adoptive parents feeling overwhelmed, abandoned, judged, criticised, hopeless and inadequate. Is it any surprise then that in the UK alone one in every five adoptions fail and who’s to say the other four live happily ever after! Support is a crucial part of adoptive parenting, without it, the results can be devastating as this poor family found out. I discovered today that my next support group meeting is more than 3 months after the last one I attended. No lessons were learnt from this poor family’s devastation it seems. Those of you who follow my blog will remember the issues we had at school a few weeks with my big girl not getting her pen license, those of you who don’t follow, can read about it here. Today my big girl came home from school proud as anything because she’s finally been given her Pen License which means she can now do her school work in pen rather than pencil. I’m very happy for her. She’s strived towards this pen license for so long now. However, it does make me question why she wasnt awarded it last time. She’s been at school a whole 6 days (due to half term) since the last time pen licenses were handed out. Her handwriting hasn’t changed much over the last 4-5 months. So why did her teacher put her through all of that upset, only to give it her a few days later. My big girl finds school academically, socially and emotionally very challenging, why does her teacher seem intent on being part of her problem rather than part of her solution. Interestingly my baby girl came home with another colourful word today, no surprises that it’s from the same girl as before. I know my girls will always be influenced by the other children in school and I’ll need to teach them to make good choices for themselves. They will have to face disappointment and heartache throughout their lives and I’ll need to teach them how to handle this. My girls are more vulnerable than most children their ages, they’ve already been subjected to poor choices, heartache and disappointment, so much so that it became a way of life for them, after all it was all they knew. They’ve only just deviated from the dark and gloomy road they were on. That road was leading them straight to crime, drugs, teenage pregnancy and self harm, it wont take much to pull them back to the rocky route of self-destruction. Protecting my daughters from bad influences and gently easing them in to the stresses of every day life is my job as their mum. It’d just be nice if sometimes everyone else pulled with me, instead of against me.